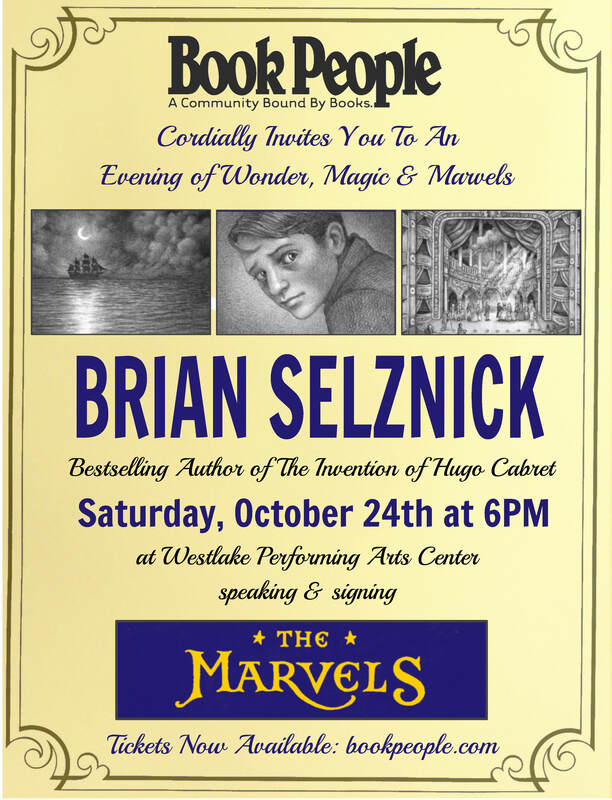 Announcing BRIAN SELZNICK with THE MARVELS October 24th! You are cordially invited to an evening of marvelous mischief, spectacular storytelling, and feats of bookish brilliance heretofore unseen in the city of Austin! Brian Selznick, bestselling author and illustrator of Wonderstruck and The Invention of Hugo Cabret, will take the stage at Westlake Performing Arts Center to present his latest creation, The Marvels. With the magic of Topher Bradfield, BookPeople’s Literary Camp Director and Master of Ceremonies, and the talent of a troupe of artists, actors and assorted other inventors, we will transform the theater into a land of adventure and imagination. Crashing waves! A mysterious shipwreck! A time-traveling photobooth! Many wonders await! Of course, our dramatic scenes are only a prelude to Mr. Selznick himself, who will share his new work with us and sign copies of The Marvels for attendees. Tickets are now available via bookpeople.com!